I wish I saw these announcements sooner. There's another night launch from Wallops, VA tonight. Should be visible from all over the NE, with clear skies up and down the eastern seaboard. Here are a few details - I'll try to dig up more later. Minotaur I is a derivative of the Minuteman ICBM. 4 stages, so be on the lookout for the staging events when one engine shuts off, the rocket glides for a few seconds and then the next stage ignites. Launch window is 7:30-9:30 PM EST, although they generally try to launch as early as possible in the window in case there are delays. for serious, there's a Google Earth file (much like September's LADEE launch) here that's super useful for scouting out a view. OK, here are some visuals for tonight's launch, plus status updates and a link to live NASA TV coverage online. That Mars map is pretty rad. Live stream just began! PERFECTLY clear here. Am I reading the video correctly that they're aiming for an 8:15 launch? I don't have a phone that can get updates, so I want to figure out when to get in the car and drive to my viewing spot. OK, yeah, they just said it on the audio as well. T-20 mins. Heading (back) to the field myself :) Get those cameras ready! Well, that was fairly cool. I picked a good spot and was able to watch from my car. I don't think I would have gotten much with a camera, in part because I was looking out over a city. I missed the first few seconds, but spotted it when it was a few finger-widths over the horizon, and saw two stage changes. There was another car parked nearby, and I went over afterwards and asked if he saw it, and he had no idea what I was talking about. Incredible!! Thanks so much eddie. The first 30 seconds were insane, what power. Makes me optimistic for humanity's future. Did you get any good low shots eddie? Red like a road flare! Awesome. Able to see quite well. I had no idea what to do for camera settings. Blurry as heck. A tripod would have helped. And the only tree in the vicinity? Right in line. Very cool. I need to find a bigger field for next time though. Despite two trips to the field and several practice shots to set up the camera I still managed to horse it all up :) Same flimsy tripod as last time. Was all set 5 mins before launch, planning to start the first 30s exp 15s after launch so the 1-2 staging would be in the middle of the second exp, but I forgot to turn on the camera! Pressed the shutter button and nothing happened. Clumsily flipped the switch and lost 5s waiting for it to power up. Then the first exp was only 2s. WTF? Second push went a full 30. Then the next few. Had to re-point the cam more than I wanted. Another 2s exp happened near the end. Turns out I had bumped the mode knob when I powered on and it was no longer in full manual but A-dep, whatever that is. All that planning for naught. Sigh. Had manual set for ISO 800, F/7, 30s exps, zoom at 28mm (wide as I could go). Remembered to turn off autofocus and the LCD. Focus to infinity. A-dep was shooting 800 F/4, so a bit too bright with the cloudcover. My glass is poor, so the less of it I use the better (by stopping it down). Some clouds moved in between 7:30-8:15. The first stage was much redder than the last launch. Maybe it was the cloudcover? Really quite thick near the horizon. Some of the first stage burn was completely obscured. Got a few shots though, so will try to salvage something. 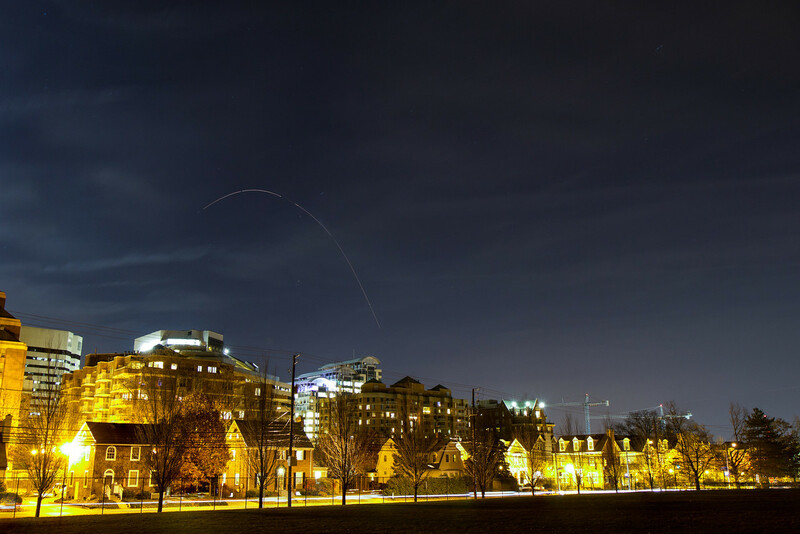 Really dig Ken's photo with the D.C. buildings! JJ: You went to a park at night and approached a man sitting alone in a car and asked him about seeing a rocket? Did he offer to show you anything? But on the subject this is much better than the day launches we see in Florida. It wasn't a park, it was the parking lot of the local WalMart, which is up on a hill and has a good view out over the city. I rolled down my window, he rolled down his, and after a few seconds of conversation I got the impression that maybe he lives in that car. A few notes on my image: It is five 30s exposures combined. It would have been good to have one more at the beginning, but it hadn't occurred to me to start before I could see the rocket. (as it was I had to rotate the camera a bit first since my initial aim wasn't quite right) I was using a continuous timer mode to minimize the gaps, but it turns out there is an initial 10s countdown before the first one, so I lost that time at the beginning. I didn't have a good sense of what angle I would need, so I went pretty wide. Here is a wider crop of the same image. Pre-focused on and exposed for the buildings. It was not easy to keep my little helpers away from the tripod legs in the dark. Eddie, you probably bumped all your camera settings while you were jumping up and down with excitement:) Not sure if this is the best source, but here is a schedule of future launches. It currently looks like our next chance to try is not far away, Dec 15th. I hope my flight back from Ohio isn't delayed. Nice. Really nice. I bet the helpers had a great time being out in the park after dark! Hard to stand still. I'll be getting my heavy-duty tripod (telescope and mount) back this weekend, so the next time I'm at my sketchy location I'll look even more suspicious. I want to have the camera piggybacked on the telescope so the drive motor will track the stars. Instead of small trails will get brighter pinpoints. And hopefully less shake. Also need to figure out how to computer control the camera. I know it can be done through a USB cable. An IR remote trigger would work too I guess. I don't think I have a continuous timer mode. A rubber band and a stick would work in a pinch. Manually controlling the shutter allows for moving the camera between expos though. That .kmz file in google earth is awesome. You could plan the whole shoot with that, setting up the zoom and pointing so you don't have to move. jj, is this what your view looked like? Here's my ground-level view, and from on high. I did move 10m east from my previous location to get out from behind a tree, which worked pretty well. Limited by a hard horizon now (the top of a landfill). The 4th stage start was well over the horizon. Would be cool to catch a late stage restart way over Africa. Close-ups through the telescope or a long telephoto would require some serious pre-planning, at least early in the flight. That looks right, although I was further NW in the parking lot (adjacent to the building) to get away from the streetlights. I hadn't bothered to look at a map or anything, and in my mind the view was more directly south, but it worked out well since the launch was to my SW. I guess I picked it up about 1/3 of the way into the part of the second-stage burn that's shown, saw the transition to third stage, and from my perspective it was still rising when the third stage ended and it went into coast. @jj: You could see this from Mass.? My brother saw the whole thing from the seawall in Swansea MA near his home. Said it was pretty neat.. The one in September was seen by people at the Pawtuckaway camping weekend in NH. Froom up here, it's not all that bright, and you definitely wouldn't notice it unless you knew exactly when to look for it. Added the next one (ORB-1) to the AP Event Calendar! Umm... Dec 15 is pretty close to full moon. That might be an issue. Eddie could you briefly explain how you created those ground level views? The terrain around here is varied enough that a tool like that would be useful in scouting for a suitable viewing location. The moon was close to full for this past launch as well (airplane bottom center). Shouldn't be an issue. If anything it can make photos more striking. Daytime launches on the other hand will be tough. Not impossible though. For the views, download and install Google Earth. Download the .kmz file for the particular launch (see bgallup's post above for link to this launch). Start Google Earth, then from the "File" pulldown select "Open" and load the .kmz file. click to zoom in on your location until you are at "eye-level," then rotate the view until you can see the launch track. Thanks, we'll check it out! Couldn't look for last week's launch as it conflicted with a choral concert our kids were in. Orbital’s Antares rocket and the Cygnus commercial cargo vehicle are now scheduled to launch from Pad 0A at the Wallops Flight Facility, Va. no earlier than Dec. 19 at 9:19 p.m. EST. NASA TV coverage of launch will begin at 8:45 p.m. EST. The .kmz file (for Google Earth) and viewing maps for this launch are located here. The launch profile is quite a bit flatter and the launch azimuth is more southerly than the last launch, so it'll be harder to see from New England (very low on the horizon). Also the first stage burns longer and there's a long coast before the 2nd stage ignition, so keep watching for the re-start after the first stage burnout. The shallower, right hand track is for the upcoming ORB1 Antares launch to the ISS, the other is the ORS3 Minotaur launch. For both tracks, orange is 1st stage burn, green is second stage burn, blue is coasting. Delayed again. This time "no earlier than January 13, 2014" The delay is due to a faulty pump on the ISS, which NASA wants to fix next week with a couple of spacewalks. Rats. Please keep us updated. Viewed two so far just standing by my front door. Very exciting and the whole family gets in on it. Latest update on the launch is tomorrow (Wed Jan 8) at 1:32 PM EST, in the daylight so will be much harder to see - look for the contrail though! The cold and wind might push it to Thurs instead. "The launch window Wednesday opens at 1:32:33 p.m. EST (18:32:33 GMT) and extends for five minutes. The launch window Thursday begins at 1:10 p.m. EST (1810 GMT), according to Orbital Sciences." Well, this is a new one for me. They are scrubbing today's launch attempt due to a solar flare. The concern is for the electronics on the rocket, not the payload vehicle (which presumably is designed for this sort of thing since it'll be in space for a while). They will set a new launch date later this morning. Looks like they are now targeting for launch on Jan 9 at 1:07 pm EST. Meanwhile there's now a Northern Lights forecast for tonight due to the solar flare. 5 mins to launch! Go outside and look now! No joy from Baltimore. Successful launch though. Replays on NASA TV now. Another launch tonight, 6:45pm eastern time. The space station is expected to pass over just 5 mins after the launch - essentially chasing the rocket, so be on the lookout for that. It will be a very bright dot moving slowly from NW to SE. ISS "directly overhead" time in the DC area is 6:52 PM. Will pass near the star Vega almost directly overhead. The slightly earlier launch - just at dusk - may end up being a bonus for observers. 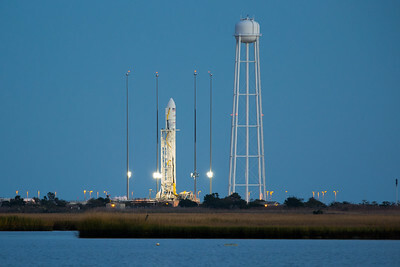 From spaceflightnow.com: "The Antares should be illuminated by sunlight as it flies into the upper atmosphere, potentially creating a dazzling sky show as the rocket’s exhaust plume is lit up like a brilliant bright cloud." Indeed! Hopefully the clouds move out of my way in the next hour!! Fingers crossed. Clouds likely to be a problem in twilight, but worth looking anyways just in case the sun lighting does something interesting. You can watch the nasa tv live stream coverage here. The OSC flight controllers are all wearing 60's style white shirts, skinny black ties and black rimmed glasses (some with tape on the bridge) in honor of Deke Slayton. Holy smokes, it blew on the pad!! Just cleared the tower and fell back to the pad :( Lots of brush still burning. Missed that but caught the aftermath :-( I was out in the middle of a field with a camera and my phone live stream kept going in and out. When it came back, fire everywhere. All personnel accounted for, no injuries. They might start to get hungry up there soon - Maj Tom, may I speak to your copilot please? Maj. Tom! Maj. Tom? There is a Russian re-supply rocket going up tomorrow, and they aren't short of anything, apparently. Its looking alot like another AJ-26 engine failure. Each one is test fired at Stennis before it is used on a flight, and one exploded on the test stand back in May. There was a prior failure in 2011, due to "stress corrosion cracking of the 40-year old metal" in a kerosene line. If they decide to stop using these old engines it could be a long time before Antares flies again. This is especially bad for OSC as it follows two high-rpofile failures of their Taurus XL launchers in 2009 and 2011, resulting in the loss of the OCO and Glory earth observing satellites. The cause of both of those losses was a fairing separation problem. I dragged the girls down to see the aborted launch on Monday, we were obviously disappointed. Now I'm not sure I would have wanted to be there. Bummer. Looks like a good viewing site though. Just 3 miles away? I'd like to go down sometime. I drove all the way to Florida for a launch once, spent a week waiting through mechanical and then weather delays, and finally had to drive home without seeing it. It launched 2 weeks after that. Its frustrating, but well worth seeing (feeling) in person at least once - night launches especially. 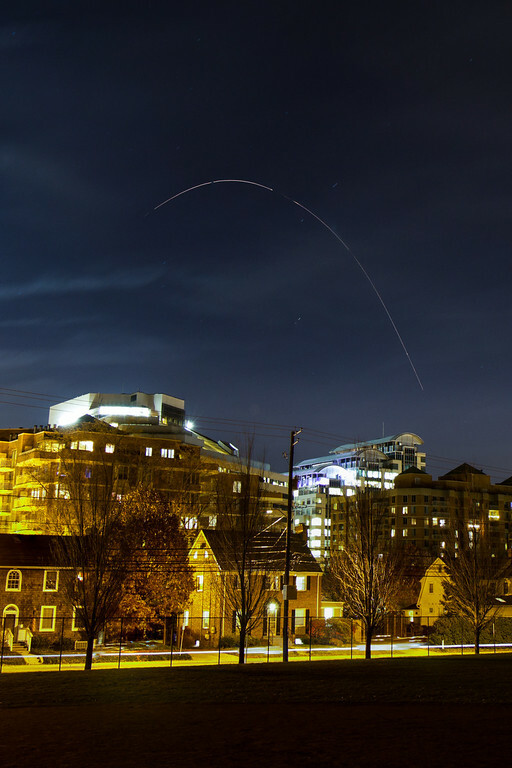 Did you see the ISS flyover? The end of Arbuckle Neck Rd is just under 1.7 miles from the pad. Apparently it is sometimes closed for launches (e.g. LADEE). We did see the ISS, so that was cool. Whoa, that's really close! I wouldn't have wanted to be that close to the explosion either, especially if the wind was onshore. The closest Space Shuttle viewing spot was 3.1 mi at Banana Creek next to the VAB - usually for VIPs. Thats where Reagan was for the final launch of Challenger. Second was 5 mi at the "static test stand," which is no longer open for viewing. Third is the KSC Causeway which is about 7 mi. That's the closest public viewing site to the 39A-B pads. Not sure if they open that for launches from Canaveral (e.g. Spacex). Will have to keep that spot in mind though. With launches directly away from that location you should get lots of thump-thump-thump from the exhaust there. My office mate said he saw the explosion from his deck overlooking the water near Fells Point in Baltimore. Not sure if that was the fireball itself (120 miles away) or the cloud deck being lit up from below. The direction is mostly over the bay, so its certainly possible. There's hydrazine in the third stage of this thing, right? Yes, the Cygnus cargo carrier has some small hypergolic maneuvering engines onboard. Probably not much though. Most of the propellant mass was in the first two stages, one LOX/Kerosene and the other a solid propellant. Not sure if the solid stuff is toxic or not. A mixture of epoxy and ammonium nitrate, powdered metals. You wouldn't want to breathe too much of it. For shuttle launches, viewers at Banana Creek often had to go inside a building just after launch to avoid breathing the exhaust of the SRBs. "Space station commander Butch Wilmore said the six crew members ran out of condiments a month ago, and he's yearning for some yellow mustard to spice up the food." That's right - they've run out of mustard on the space station! Serious problems indeed... When´s the next mail delivery? Nominally 10:09 GMT (5:09 AM EST) Friday, plus a couple of days in-transit. I don't think I could wait that long...for mustard.